I was listening to a KCRW Good Food podcast today and heard about this new (to me at least) product called wine flour. This company Vinifera For Life out of Canada makes it – and has been doing so since 2006 – so it’s not like this is breaking news, just to be fair. But now this firm called Marche Noir makes food for sale using wine flour made from Cabernet Sauvignon grapes, including brownies and pasta. Wine flour is made from the grape skins and seeds (sometimes called pomace) that are left over from wine making; Vinifera for Life sources its product from the Niagara wine region in Canada. You may recall me mentioning that most of the taste of a wine comes from the grape’s skin; grape skins are where polyphenols like tannic acid, anthocyanins and flavenoids live, and winemakers generally get those compounds into wine by crushing grapes and letting the juice extract flavor and color for a period of a couple days (in the case of rose) to a couple weeks (in the case of red wine). 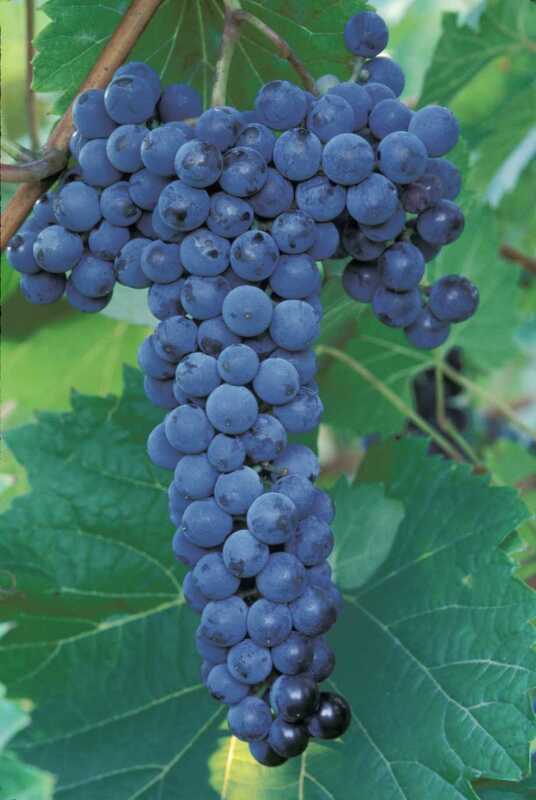 One of the most famous polyphenols in wine is called resveratrol, which is famous for its anitoxidant properties and other reputed health benefits. It’s the health benefits of resveratrol that has been garnering a lot of internet interest in wine flour. I confess that my interest is more from a taste perspective: I keep thinking about what one could do with a pasta that tastes like Cabernet Sauvignon. My favorite notion is a blue cheese alfredo sauce with toasted walnuts; blue cheese and walnuts are great together and are also great with Cabernet. Other interesting pairings might include shredded duck breast tossed with cabernet pasta… what do you think? How would you prepare the perfect dish of cabernet pasta? Unfortunately, I have yet to be able to talk myself into paying $8 for the pound of pasta and another $8 for shipping it to lovely Austin, Texas from California. I can’t find a local producer of wine flour pasta, and I confess that I am too lazy/busy to make my own. So I guess I’ll have a lot of time to kick around recipe ideas in my head… until I get over my cheapness, or Whole Foods decides to pick up Marche Noir’s fascinating new products. (hint, hint) If you’ve tried something made with wine flour, or worked with it yourself, I’d love to hear about it! Honestly, I don’t know how this bottle even got into my cellar. It looks like something I would buy; (1) it’s Argentinian, so reasonably priced, (2) interesting grape and (3) just plain fun to say. Heh, kidding on number three. I don’t buy wines because they’re fun to say. Much. Bonarda is a super-prevalent grape in Argentina and nowhere much else. In California, it’s called Charbono but doesn’t enjoy the same level of popularity. 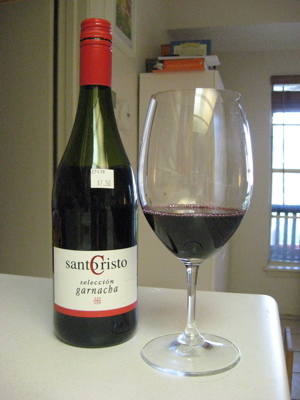 Bonarda (or Charbono) is used generally as a blending grape due to its ink-dark color and intense tannins. Evidently Argentina is experimenting with single-variety Bonarda wines. Cool! 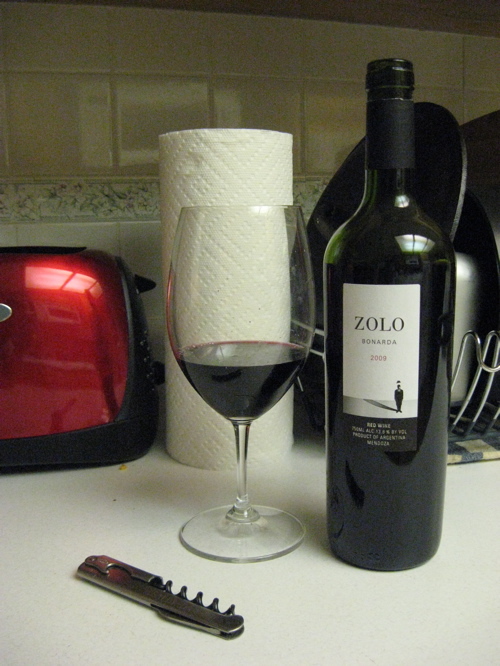 Zolo is a wine brand made by Finca Patagonias; they mostly do Tapiz, and describe themselves as “one of the most technological wineries in Argentina.” Which, totally not trying to be condescending here, cracks me up. That usually tells me that they’ve got solid grapes, maybe always have, and now focus on the science of making large quantities of stable, crowd-pleasing wines. Fair enough. 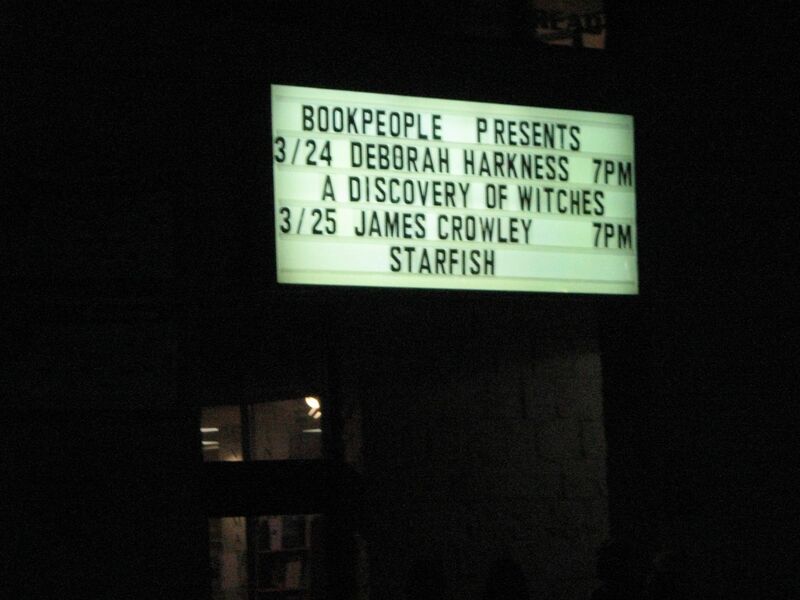 The color is all Heart of Darkness, all the time in the glass. The nose is pretty hot, with stewed blackberries, jammy jam and dusty earth notes. The palate is spare – prunes are hanging around, and there are certainly tannins, but there’s also enough acidity to keep them from waking the baby. And then there’s that smoky, toasty, don’t-call-me-fruity-or-I’ll-punch-you finish. Something about this wine makes me think of… leather. Not black leather, as the color would lead you to believe, but the dark brown leather of good riding boots. All the dark tones of this little goth number make me think of what to pair it with. Duck confit? chocolate coated pepper steak? boiled leather aux herbes? Actually, the chocolate isn’t far off the mark – I snuck some dark chocolate chips out of the freezer, and they’re a hit. But the smokiness of this wine makes it an excellent wine to go with my husband’s favorite food… Texas barbecue. Yep, 12-hour smoked beef brisket would totally make out with this Bonarda. They can get all intense and philosophical together, and talk about how they hate their parents. It’s a date. I buy all nearly all my wine in large batches. Part of it is because there are frequently deals in my local wine shops in which you get 10-20% off when you buy a case. A mixed case, of course – I’m never in a position to buy a whole case of one wine at a time, as tempted as I might be. Though I admit that I have considered buying that Famega by the case. So in this last batch of wine, I bought a selection of white wines under $10. It’s not easy to get a viognier for around $10 – the grape is a pain to grow and all – but Oxford Landing is a good bet for value, no matter the grape. I think I paid about $8 for this bottle. This is a bit of a case of “you get what you pay for,” but not to the point of Stop Drinking. The nose is heavily perfumed, almost soapy, with notes of overripe peach and newly cut oak slats. Palate = lemon, nectarine, something greenish, and cream. Weirdish, like apple ice cream. I mentioned a couple of posts ago that this wine did not pair well with a PBJ (J was strawberry jam). I was thinking about that, and viognier is actually a wine that I would have picked for PBJ, in that the body might stand up to the peanut butter oil. Alas, a tannic wine would probably be better; the viognier was just nasty with it. The wine WAS quite pleasent with beef stroganoff, though. Makes sense; cream to cream, you know. Unless you like a thick and creamy wine for sipping, this is not a “sit down and glug a glass in front of the TV” kind of wine, to my mind. Good for pairing with creamy dishes, as mentioned, and perhaps some cheesy enchiladas or some such. Peach melba. Fondue? Enchiladas suizas might be the perfect dish… just brainstorming here. Thanks to an impromptu chat with a wise new mother, I was suddenly inspired to throw off Preggo Prohibition and Freaking Have A Glass Of Wine Already (my words, not hers). Yeah, mothafuckah……! (flips the upside-down bird at abstinence) Take that! I’m BACK! 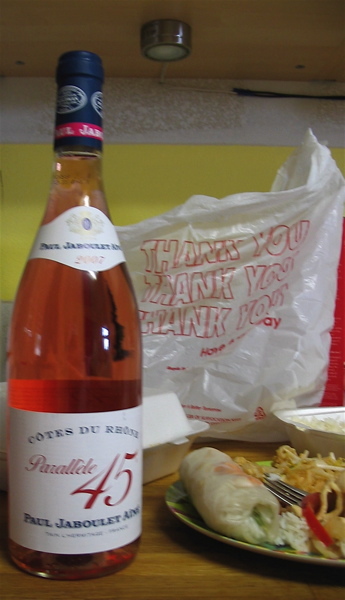 Since the rapidly growing criatura is the size of a turnip this week, we’re celebrating said humble root vegetable with take-out Thai food and a Jaboulet “Parellele 45” Cotes du Rhone Rose 2007. Makes sense in my head, anyway. After ordering the Scamp household classic Thai food comfort order (spring rolls, pad thai, red chicken curry), I toddled off to World Market for some wine, thinking vaguely that they might have chilled wine. It’s been so long since I opened my cellar closet door, I couldn’t even remember what was in there, and I certainly haven’t been keeping anything cold. WM doesn’t have a cold box, unfortunately, but I enjoyed browsing anyway and I bought a couple of wines from their Wine Speculator Top Whatever List display (an 05 Lehmann Shiraz and a Mosel Riesling), but for tonight’s momentous occasion I grabbed the Jaboulet Rose for only about $11.99, which is reasonable if not ridiculously cheap for said bottle. I mostly went to WM because it was quite close to the restaurant, Blue Bamboo, which is the Thai place closest to my house. They’re both in this ridonkulous strip mall on Highway 71, and I was mitigating the guilt over my splurge on Wednesday’s dinner by not driving all over creation. For the record, in Texas this can be a challenge. I have found some decent inexpensive everyday wines at WM, so I have to give it at least a B- as far as a wine shop goes. Blue Bamboo gets a C, I think, after their second chance. 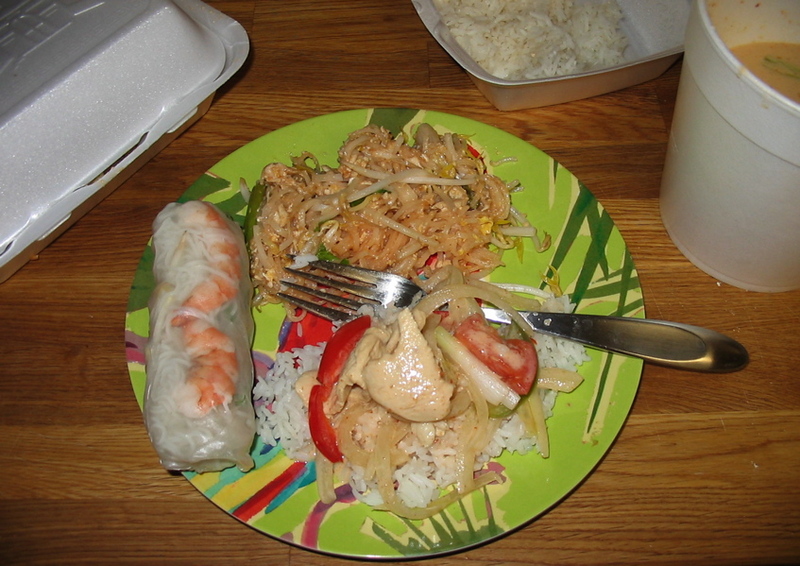 It took a Really Long Time to get my take-out order, and their pad thai is stunningly bland, though the red curry was acceptable and the spring rolls had nothing particularly wrong with them. I’ll try eating in the restaurant before I give up on them completely, but Thai Spice in Lakeway is much better, for the same money or less. The wine wasn’t cold when I brought it home of course, and the bean was insisting on food immediately upon my arrival home. What’s a wine lover to do, in this situation? 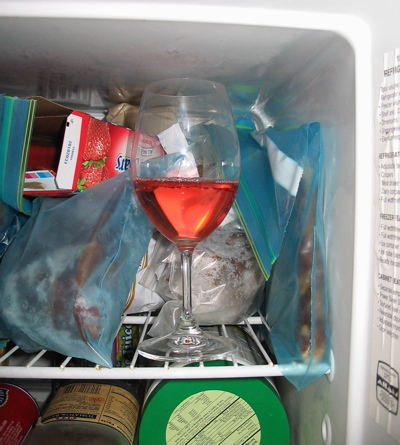 Unless you have a way cool insta-wine-chiller, I recommend the method indicated in the photo. The Jaboulet CDR Rose is a charming salmon pink in the glass. Nose of grapefruit, raspberry, and strawberry, with a hint of herbal-greeniness. On the palate, this mutha is TART, with flavors of strawberry lemonade with mineral ice cubes. Nice body and comfy mouthfeel. A tasty rose, complex for its price point, but not too involved. With the pad thai, which needed lots of lime to bring it to life a little, the wine’s fruit just disappeared, leaving all the tartness and mineral – rather not The Thing, if you understand me. With the curry, however, which was much spicier and had that sweet-creamy richness of coconut milk, the fruit was much more forward. It was kind of like the tartness, and to some degree the mineral, was so busy fighting the hot pepper that it never made it to my tongue. 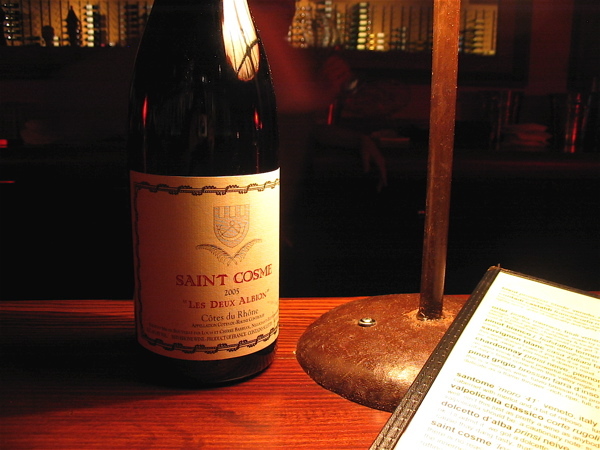 The wine is made up of 50% Grenache, 40% Cinsault and 10% Syrah, according to Jaboulet’s website. I’m not going to gabble on about the French region of Cotes du Rhone just now because it’s late and my womb treats everyone better when I get some good sleep. 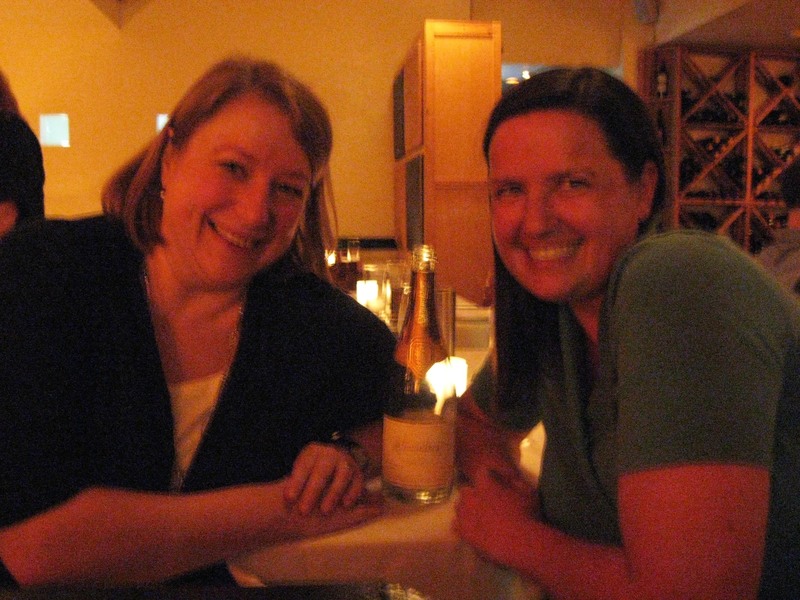 More than one post in June, though – I promise! Jeepers, it’s been a week since I stopped in to Vino Vino for a glass of wine to let stupid Austin traffic die down. VV is one of those places that make me really wish I lived closer to town. They have engaged, educated servers who provide a cozy experience for someone just wandering in by herself. The bar is dark, but with warm light spilling from lamps and bottles lining the walls. In another two months, when the Texas Heat of Death begins to really hit its stride, this place will be a cool, soothing godsend. I mean, seriously – how do you NOT taste a wine written up like that? I personally found it to present dusty, heady raspberry aromas, white pepper, slight truffle and some of that umami edge of aged cheese. 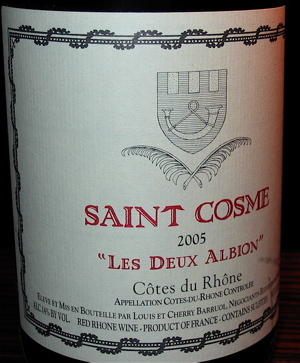 On the palate, it’s crispy with tannin on the edges with an ooey-gooey fruit center. This wine gets a tight grip on your lips and teeth and proceeds to spew all over your tongue with earth and brick-house raspberry goodness. I chose the country pate to go with my wine, despite the bartender’s recommendation of the “Portuguese gumbo” soup, and I probably should have gone with her idea. The pate was excellent, don’t get me wrong, but it was too rich for the Cotes du Rhone. Or rather, the wine’s tannins met their match with the fatty pate, but then the acidity just went crazy. It was much better when I added some red onion, capers, olive or a cornichon. I bet it would have been great with a thinly sliced tomato, too. Vino Vino will open most everything on their shelves for a nominal fee, and their wine by the glass list is really unusual. They’re pouring a Franciacorta, a Dolcetto and a Corbieres, among other gems. Lots of wines you’ve probably never heard of, but all of them good. Trying to clear out the fridge, readying the kitchen for the remodel, so thought I’d cook an old stand-by on Sunday, greek chickpeas with spinach. This is a great, cheap, quick meal that I can just eat forever. Served it on brown rice with petite peas, topped with feta cheese. On the way back from the grocery store (just for the feta, I swear) I stopped by World Market, having been told one too many times that they have great prices on wine. They were having a tasty little sale on about 50 wines, 10% off when you buy 4. The selection is just as I recalled it being, rather pedestrian, but with a few interesting points. They did have a neat selection of Texas wines, impressively. I picked up a South African Chenin Blanc for $8.99 and this Veramonte Sauvignon Blanc for $9.99. Also a lovely throw pillow for half-price. I won’t be reviewing the latter. I was on the fence as to which wine to drink with dinner; the Chenin Blanc would have the roundness and body to stand up to creamy flavors like chickpea and feta, but the dish is really lemony, with tomatoes and spinach, which made me lean in the direction of the SB. As it turns out, the pairing couldn’t have been better. Almost completely clear in color, maybe only slightly straw-tinged. Bright, zesty aromas of passionfruit, grapefruit and melon. Hints of floral notes and a big grassy shalamazzama. Driving, intense acidity on the palate with steroid-pumped lemons and grand swaths of green grassy flavors. And, oddly, you know that strangely mellow bite of a really unripe banana? That, too. The wine went well with the chickpeas; the spritziness met the lemon in the dish, and the herbal character winds up around the spinach and shows it how to jig. 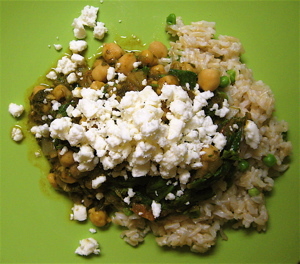 I had expected some trouble from the feta, but it all came out very nicely, as did the creamy flavor of the chickpeas. We stay with an overall lemon flavor, very pleasant, after the jubilee’s all done. Veramonte is a Chilean winery, founded in 1996 by Agustin Huneeus. You may recognize him as the founder of Concha y Toro, Franciscan, Estancia and Quintessa. All now belong to large corporations except for Veramonte and Quintessa. Veramonte is a really reliable, inexpensive wine brand that nearly always delivers. Their Sauvignon Blanc is well-known and quite delicious all the dang time. One thing about wines from the Southern Hemisphere to keep in mind, especially in the case of Sauvignon Blanc which you almost always want to be young, is that they’re on the opposite seasonal schedule from us northerners. Thus if you’re shopping for Chilean SB in February of 2008 in Texas, 2007 is just right. 2006 will do, 2005 is a bit past it, and 2004 is OK only in a pinch. In any case, I’ve spent $10 a lot worse this week, and so will you, unless you spend it on this lovely, wrought-iron delicate Sauvignon Blanc. I received this wine as a sample for tasting. 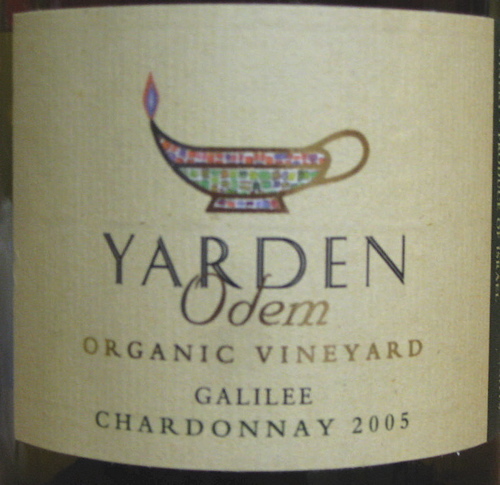 I’ve had Yarden before and enjoyed it, but that was a long time ago – before I had really started learning about wine. Bright gold in color. Nose of butter, honey, hazelnut and cream. Woodsy on the palate, with candied apple, tropical flavors and rounded creamy tones. Slight bitter astringency from oak tannins, a hint of copper penny minerality and a lingering finish of Golden Delicious apple. 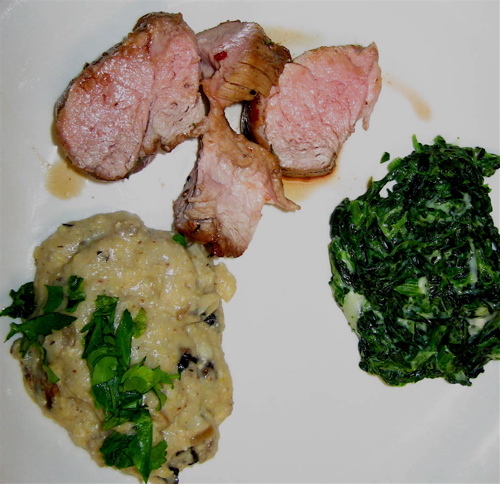 I was hoping that this might pair well with maple-glazed roast pork loin with rosemary that I had planned for that evening, and I whipped up some creamed spinach and creamy polenta with garlicky mushrooms. I rarely prepare Cooks Illustrated recipes, as they are usually complicated despite their relative perfection. This pork loin, however, looked quite simple and seemed to result in a minimum of pans to clean. Of course, I mucked that up for myself by making those two side dishes, but there you are. 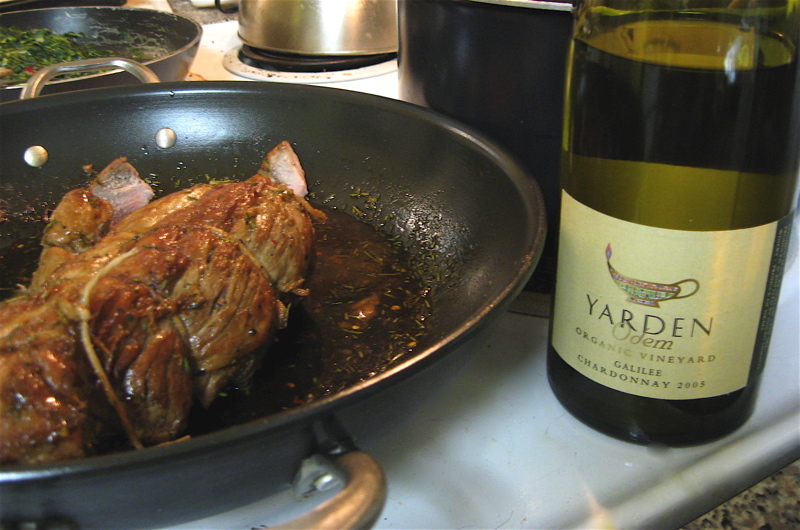 The Chardonnay took the pork easily, and the rosemary was felicitous, but the maple syrup glaze brings a candied element to the wine. The wine was divine with the creamed spinach; creamy flavors met buttery wine, and the spinach tasted clean but without bitterness. The polenta was an interesting pairing; the oak tannins quarreled with the corn flavors, but the parmesan was oddly OK with it all. It was kind of like the stereotypical Italian family, where yelling is the norm but no one takes it wrong. The Galilee region of Israel is the northernmost wine appellation in the country, and the coolest growing region. The Odem Vineyard has been farmed organically since 1998, and is located at an elevation of slightly under 4,000 feet. Israel, of course, has been making wine since time immemorial. One big blip in this millenia of history was when Baron Edmond Rothschild aided a group of Jewish immigrants to Israel in 1882 by sponsoring their attempt to found a winery. They struggled for a while, but in the end Rothschild built two wineries in Israel. His son donated the wineries back to the growers cooperative in 1957. Israeli vineyards started modernizing in the 70s, and now owe more to California than they do to France; this Chardonnay is certainly testament to that. Golan Heights Winery, which produces Yarden as well as two other labels of wine in Israel, is one of the houses that’s lead the charge to bring the entire industry up to world standards. I’d say they’re there. So after some disappointing explorations of some smaller Austin wine shops, I finally took the time to really explore the Austin Wine Merchant, and I must say I was very pleased with what I found there! They have an exquisite French selection, some off-the-beaten path Italian reds, and they sell bin-ends for a tidy discount, which allows me to build a cellar with things I probably wouldn’t normally pick up. Why is it that $5 or $10 off a bottle makes it nearly irrisistible? Madness!